Porcelain tile vs solid hardwood flooring – comparison chart. Available in variety of styles for	any house design. Popular colors: brown, white, grey, beige, and yellow. Many tiles are multicolored. Stunning natural look of wood. Manufactured or can be on-site stained in wide range of colors and shades. Most popular species: oak, maple, hickory, and cherry. Good for any room. Best choice for heavy traffic areas and rooms with potentially high moisture level including bathrooms, kitchens, hallways, and basements. Suitable for majority rooms in the house, but shouldn’t be installed in the areas below ground level. Not recommended for installation in bathrooms, powder rooms, laundry rooms or any other rooms with potentially high moisture level. Best choice for living rooms or bedrooms. 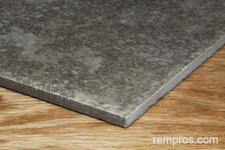 Dense porcelain tile surface easily withstand any abuse, but feels hard under the feet. Wood flooring surface can be easily damaged by heavy abuse or constant liquids spills. Wearing layer of porcelain tile impervious to pet urine and hard enough not to be scratched by even bigger dog’s claws. Pet urine can damage wood floors. Hardwood flooring can be scratched by pet’s claws. Porcelain tile is insusceptible to stain. With omitting sealer application, grout between tiles might lose its appearance overtime. Even highest quality solid wood floor could be stained and discolored spots might appear on its surface if water, juice, pet urine or other liquids won’t be eliminated from the floor immediately. Porcelain tile won’t be damaged by water staying on tile surface for a few hours. Water or high moisture level in the room can cause multiple problems with wood floors after installation. Cupping, warping, crowning or bucking of hardwood flooring strips or planks is a result of water, moisture or humidity impacts on wood floors. Porcelain tile do not fade, do not change color under direct sunlight or any other conditions. Sunlight can cause discoloring of hardwood floors. Some wood species might even change their color overtime under normal light intensity. Porcelain tile rated 4 or 5 on the PEI abrasion resistance scale is one of the most durable flooring material on the market. Depends on species and finish quality. For comparison, Brazilian teak rated 3540 on the Janka hardness scale of wood while red oak 1290, or nearly 3x softer. But wood in general is not as hard flooring material as porcelain tile. Lifetime with proper installation and care. Lifespan vary significantly. Wood floors can last for over 70+ years if installed properly and maintained adequately. Minimum care required after installation. Regular cleaning and elimination of any liquids from wood surface right away is essential factor which ensure long lasting flooring performance. Warranty on solid wood flooring depends on a manufacturer and product quality. Most hardwood floors producers offer 30 – 50 years limited wear warranty on their products. Boxes 6” x 6”, 12” x 12”, 16” x 16” or 24” x 24”, but other sizes are available. 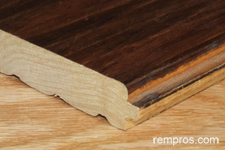 Solid wood flooring strips or planks normally sold in cases 48” - 84” long. Parquet wood flooring in cases 60 in x 60 in. 0.3125 in. – 0.375 in. 0.375 in. – 0.75 in. Porcelain tile normally cheaper to buy per square foot compare to wood flooring. Prices greatly vary and some exotic hardwood flooring including Tigerwood, Brazilian redwood or Royal mahogany might be quite expensive. Cost of porcelain tile installation normally higher compare to laying hardwood floors. In addition, purchasing cement backer boards, mortar and grout will result in extra expenses. Normally it is cheaper to install wood floors compare to tile. Setting porcelain tile on mortar. Nail down over wood subfloor, glue down. Normally porcelain tile harder to install. Solid prefinished wood floors installation is not a complicated task and many homeowners are able to perform it as a do it yourself project. Installation, sanding and finishing wood floors at a job site is more complex process. Depends on complexity, but in general, for an experienced tile setter tiling 9’ x 11’ bathroom floor using 12” x 12” or 18” x 18” tile is one day project excluding possible preparation work and grout application. Experienced hardwood installer with helper normally is able to complete nailing down 2 ¼ in. wide solid hardwood flooring strips in couple 11’ x 11’ bedrooms in one day, not accounting any preparation or extra work. But complex installation might take few times longer. 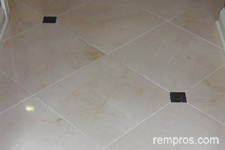 Replacement of porcelain tile set on mortar could be an extremely time consuming process. Demolishing of existing tile and preparation work might last twice longer compare to installation of a new tile itself. 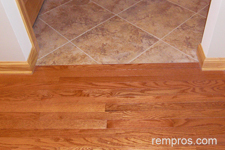 Demolishing and replacing glue down hardwood floors might take same time as replacing porcelain tile. Nail down wood flooring normally easier to remove. With adequate installation porcelain tile flooring shouldn’t have any problems except grout lines discoloring which can be easily fixed by cleaning and (or) regrouting tile. Cracks are normally a result of poor completed project or a bigger problem with the whole house structure. Solid wood floors are much more susceptible to damages and even properly installed quality hardwood flooring can be easily damaged by high moisture level in the room or simply placing heavy and sharp objects on its surface. But hardwood floors can be refinished a few times after installation what is impossible to do with porcelain tile or any other flooring materials. 1 Rating of flooring materials was estimated on the scale from 1 to 5, accounting 1 as lowest and 5 as the highest quality of a product. Always consider the fact: not all products made equally the same and performance of certain material significantly depends on individual product quality, adequate installation, and proper maintenance. Porcelain tile and solid wood flooring are great flooring options with their own advantages and disadvantages. Which one to purchase depends on many factors and there no general answer which floors are actually better. Type of a room, ability to take cake about floors properly and homeowner’s preferences should be taken into account while choosing between tile and hardwood.